Stand out from the crowd and get your message across with this unique animatronic Robot Head ! The Stand Alone Animatronic Display, 'Robot Head' shown in the image, has all of the features you would expect to find in a modern display device. It is a completely self contained unit for the instigation and control of Moving display sequences together with audio playback (using the built in microcontroller). It will also run directly under the control of a P.C or Tablet device for a more interactive experience. Colour ccd cameras in the eyes can be used to provide viewer feedback to visual recognition software, or for EAS (Electronic Article Surveilance). Other sensors are easily integrated into the front of the device , such as a PIR Sensor to activate the unit when a person walks past. When you advertise a product or simply convey information using an animated display the Human eye responds very quickly to movement therefore the moving display will stand out from other advertising media. The Robot Head shown above was recently used in a Music Video , where the lips were synced to the robotic voice of the recording artist and the head was bobbing. (I will provide a link when possible ,see Jack Conte Music for release date). 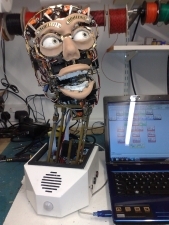 The Robot Head may also be used as a test jig for scientific or educational research. The images are genlocked so have sync pulses in phase with each other , this enables either analog or digital signal processing (dsp) techniques to be applied to the images ,this including 3D images. discuss your requirements , or to arrange a visit at my workshop in Stansted Mountfitchet.